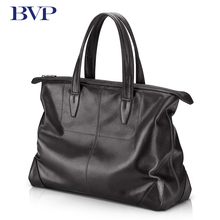 BVP men's briefcase, business leather handbag, men's leather bag, casual cross section, large capacity travelling tide male bag. Travelling bags, collapsible baggage bags, portable bags, women's large bags, men's short bags, travel bags. Men's dry and wet separation exercise bag, beach swimming bag, female waterproof, hand-held single shoulder skew spanning cylinder.